Hall of the Mountain King: Review: Sons of Liberty, "Brush-fires of the Mind"
Review: Sons of Liberty, "Brush-fires of the Mind"
So Iced Earth guitarist Jon Schaffer, who has always seemed a very patriotic sort, has now launched a side project Sons of Liberty and electronically self-released a debut record Brush-fires of the Mind (out today in physical form on Century Media). The project is heavily political and obsessed with conspiracy theories. He’s said that he intends the band and its website to become a “think tank,” so he obviously has aspiration for it beyond just music. That’s all well and good, but first you have to have the music, and most of the songs from this record are mediocre at best. 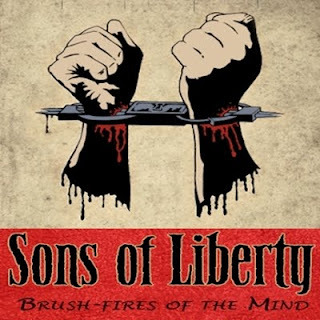 Not surprisingly, Sons of Liberty sounds an awful lot like Iced Earth. Since his primary band is practically Schaffer’s solo project anyway, there’s not a lot that’s musically different other than the inclusion of sound bites from political speeches. I’m not sure who else is involved in the project as there’s no list of contributors on the site, but Schaffer handles the guitars and vocals, and therein lies the first problem. Schaffer’s vocals are good enough to do a mock-up of a song for Matt Barlow or Tim Owens to sing and they’re good enough for back-ups and an occasional lead vocal, but they’re not good enough to carry a whole record. Songs that would otherwise be solid, like the dark “False Flag,” are weakened by the sub-par vocals. The harmonies that sound so good in Iced Earth are rough on “Our Dying Republic,” and when I listen to the venomous “Indentured Servitude,” I’m just imagining what it would sound like with Barlow or Owens. It would be one of the better songs Iced Earth has done in recent years. Don’t get me wrong. I’m glad that Schaffer didn’t release this as an Iced Earth record because it is something more personal. With a few exceptions, I’m not a huge fan of heavily political music. I’ve always been part of the “just shut up and sing the damned songs I came to hear” camp. I’d rather hear Iced Earth stick with the fantasy, horror and science fiction themes that have been their stock in trade over the years (the excellent The Glorious Burden being the exception), and I think to put this out under the Iced Earth moniker would probably do more damage to a band that’s already been weakened in recent years. Considering that this is a record with a mission to spread a message, you have to address the lyrical content. Let me preface my comments on the lyrics by saying that I’m a full-on, red-blooded, flag-waving, gun-toting redneck, so I’m not speaking from a completely opposite side of the fence from Schaffer, but I just have a hard time buying into the vast conspiracy theories of shady, evil puppet masters pulling the global strings. Perhaps it’s because I’ve been hearing about the liberal media conspiracy my whole life, and having worked in media for 15 years, I know how laughable it is. Usually, we can’t coordinate things across the room, much less across the globe, and from what I know of government agencies, I’d suspect the situation is similar there. I’ll admit that there are some good points to the messages here. There’s much about thinking for yourself, questioning authority and standing up for your rights, all things I can firmly get behind. The main problem for me is the lyrics sound like just that – a message. More often than not, they seem to be written primarily as a sermon from Schaffer rather than song lyrics. It’s obvious that he’s passionate about the subjects here and wants to make people think. In that respect, I applaud the effort. Too often, though, it comes off sounding a little like wild-eyed craziness. Brush-fires of the Mind features some very good moments scattered throughout, like the aforementioned “False Flag” and “Indentured Servitude.” “Tree of Liberty” reminds me of Empire-era Queensryche, and would be an absolutely awesome song with Geoff Tate in his prime handling the vocals. Likewise, I can hear Warrell Dane’s warble on “Feeling Helpless” and how good it could be. While I doubt either of those guys would feel comfortable with singing these songs, one can always dream. Sons of Liberty is worth a listen for fans of Iced Earth, and you can hear it free on their website. With better vocals and a bit less emphasis on the conspiracy theories, I’d probably really enjoy the record. As it is, it’s much like The Crucible of Man. There are a few songs I might return to, but if I’m in an Iced Earth sort of mood, I’ll more likely grab The Dark Saga, Something Wicked This Way Comes or The Glorious Burden. 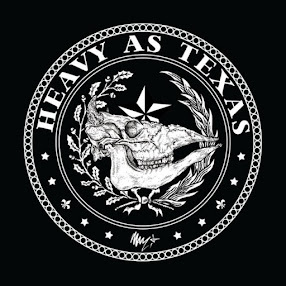 Here’s hoping this record helped clean the slate so he can deliver the goods with the new Iced Earth record he’s currently in the studio working on. Get "Brush-fires of the Mind."